Let’s Burn Another Witch to Stop Armed Murder! There was a time when children cried so we burned witches. Today, we have some 23 thousand gun control regulations. We pass new regulations each time a celebrity gets shot or some white kids get attacked. We’ve burned that witch before. urgently needed..life saving..essential reform..violence prevention..common sense..crime control..limit armed terrorists.. controlling dangerous weapons..firearms safety..controlling unprecedented weapons of war..public safety legislation..
..and it sounds so wonderful. You have to ask yourself some questions if you don’t believe the overhyped press briefing. If each of the 23 thousand gun control regulations were all that we were told, then why do these regulations fail every few minutes and we have another violent crime? I thought all those earlier laws fixed that. Gun control laws don’t stop criminals because criminals don’t obey our laws. (We can document that obvious point if you need.) Gun control fails because we don’t prosecute criminals with the laws we already have. Gun control fails because background checks look backwards at a person’s history. That gives criminals and crazies one free mass murder before they become prohibited persons. At best, gun control isn’t much of a solution. We’ve looked very hard at the data. Gun control does nothing to reduce violent crimes like mass murder, armed murder, armed robbery and aggravated assault. (And here, here too.) Some data says that gun control disarms the honest people so crime actually goes up after gun control is passed. And before you ask, the police collect crime information, mostly for insurance purposes. The police rarely stop violent crimes in progress. If the stacks and stacks of gun control legislation failed before, then why do we expect the next bit of legislative-ink-on-paper to stop the next violent criminal? The truth is, we don’t. Neither do the politicians who pass these laws. Why do politicians keep calling for more gun control when it is such an obvious failure? That is an important question. We have to ask what gun control actually accomplishes in order to answer it. Violence is both complicated and simple. Unfortunately, armed criminal violence gets further complicated by politics and personal agendas. It turns out that the important work of passing gun control isn’t about stopping violent crime at all. Gun control legislation makes us feel safer and in control. We might notice that there are violent people in the world..but a few well chosen words on paper will fix that so we can go back to watching videos on our cell phone. Gun control provides personal absolution. We can pretend to change the world rather than change ourselves. We don’t have to protect our children, lock our doors, or treat the mentally ill. All we have to do is regulate a piece of metal and plastic. Gun control lets politicians appear competent and capable of controlling violence. That is why politicians keep saying, “We have to do something.” The something they have to do is to appear relevant and electable. Gun control lets the politicians distract us from his real political failures that actually produce violence in society. You’ll notice that long term democrat control almost always results in a violent city. That isn’t an accident. Violence is strongly associated with fatherlessness, unemployment, gangs and addiction. Gun control lets preachers sell compassion. Lots of activists make money by selling gun control. Come virtue-signal, and join today! All major credit cards accepted. Gun control lets newscaster sell soap. (News editors love a disaster because it means we’ll watch more news.) If the media really wanted to stop violent mass murder, then they wouldn’t turn the murderer into a celebrity. The media wouldn’t name the murderer and would not put his face on the television for days on end. This matters a lot. There were over 70 copycat crimes after the Columbine High School murders..and they were preventable. Gun control lets socialist billionaires expand big government. They want us disarmed. That is for their benefit, not ours. And they are willing to pay tens of millions of dollars to get what they want. Those are very powerful forces at work. No wonder we try the same failed idea time after time. Until we are willing to dig past the headlines, we simply burn another witch and pass another gun control law. After all, it made us feel better last time. I don’t have all the answers. I’m not even sure which will come first. Will we stop distracting ourselves with gun control, and then look at the real causes and solutions to public violence? 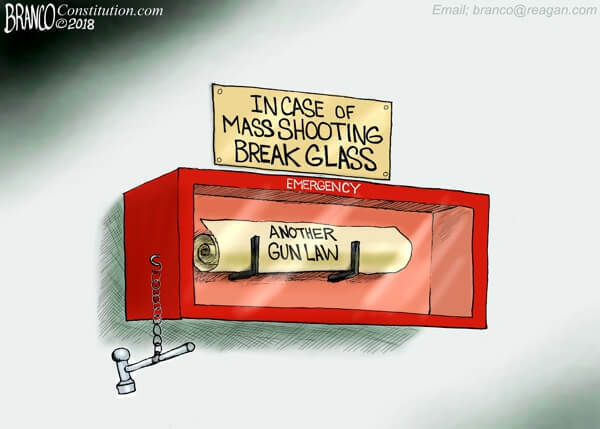 Will we implement a few effective measures and then stop wasting time with gun control legislation? Either would be fine, and not a minute too soon. Possibly or probably due to the fact that they try to obfuscate the plain fact that the steps they continue to propose, the steps they say they want to take have an all go well established record of abject failure. Ergo, rather than admit error, they seek ever more of the same. Great Britain has the kind of extreme gun control that our anti gun crowd can only dream about. In 2010 UN statistics stated that Britain had a violent crime rate five times that of gun crazy America. And now in the first few months of 2018 London reports more murders than New York City, both being roughly the same in population. Thus a modern first world country with much in common with the US becomes the perfect example of how gun control is a complete failure. Re your close, might I add the following. That is if one assumes that the failure of Gun Control had not already been well demonstrated. Now comes Knife Control, which will have no desirable effects on criminals, terrorists and putting it somewhat bluntly, the ever present nut cakes. I see what you did there. I like it. Sharp. You’ve said that before. I wrote about the superstition of gun control Does your comment have anything to do with that? Repeating unrelated comments is a form of spam. You’re about to get banned from my site..permanently. Last warning. Beautiful article, straight and to the point. In the April 2018 America’s First Freedom, there’s an article by Frank Miniter about how the Cleveland, OH City Council passed gun-control laws that were struck down by the OH Supreme Court. An alderman who voted against the bills challenged his colleagues as to how these laws would stop crime. The boilerplate response. “We have to do something”. In other words Cleveland City Council KNEW these bills were do-nothings, yet passed them anyway. Does It Seem Like Public Safety Is Being Sacrificed To Special Interests? From 9/11 to Beslan: Which Lessons Have We Still Refused to Learn About Terrorism and the Next Mass Murder?